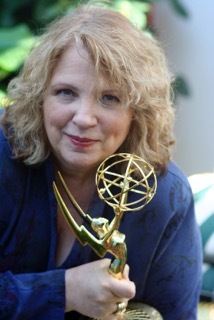 Deborah Barylski, a St. Louis native, is an Emmy-Award winning casting director. In a thirty-five year career, some of her most recent credits include THE MIDDLE, ARRESTED DEVELOPMENT (for which she won the Emmy), LIFE WITH BONNIE, STILL STANDING, HOME IMPROVEMENT and JUST SHOOT ME, as well as past favorites FRANK'S PLACE, THE FAMOUS TEDDY Z and DOCTOR, DOCTOR. She also cast the feature, PASTIME, which won the Audience Award at Sundance in 1990. She was nominated for the Artios Award for excellence in casting seven times, and won the Artios in 2003 for ARRESTED DEVELOPMENT. Her first love, however, is the theatre and she has directed in theatres in Michigan, Illinois, California, and Alaska. She was the assistant director and contributing editor to the world premier of TRACERS, a play which ran two years at the Odyssey Theatre in LA, with further productions in New York, Chicago, and an international tour. Her most recent full-length Los Angeles directorial outing, the world premier of SOLACE by Jake Jay Clark, garnered three L.A. Weekly Award nominations, including “Best Direction,” “Best Original Play,” and “Best Ensemble. She was selected to direct in the auspicious Ojai original Christmas play series in 2010. Parallel to her casting career, she has held acting for the camera, cold reading, and audition classes in Los Angeles, Chicago, San Francisco, St. Louis, San Diego and Vancouver, Toronto, among many others. She holds professional memberships in the Casting Society of America and the Academy of Television Arts and Sciences. She was a member of the American Theatre Association for twenty-five years. She holds a B.A. in theatre from Southern Illinois University at Edwardsville, and a Master's in directing and theatre management from Illinois State University at Normal. She has been inducted to the “Hall of Fame” at both Alma Maters. She resides in Santa Monica, California and St. Louis, Missouri. Lara Teeter has performed, directed and choreographed for major regional theatre and opera houses nation-wide. He is currently a Professor of Theatre, Head of the Musical Theatre Program at the Webster Conservatory for Theatre Arts here in St. Louis. Previously, he taught for Shenandoah University, Northwestern University and California State University at Fullerton. Lara has performed in three national tours and six Broadway shows, including the revival of the Rodgers and Hart classic, On Your Toes, for which he received a Tony nomination and Outer Critics Circle Award. From 1999-2004, Lara served as Artistic Director of Light Opera Works in the Chicago area, and in 2000 made his Carnegie Hall debut followed by his Lyric Opera of Chicago debut in 2001. Since 1990, Lara has performed on the MUNY stage in shows such as Singin’ In the Rain, The Wizard of Oz, Little Shop of Horrors, White Christmas, Hairspray, Beauty and the Beast, The Little Mermaid, Bye, Bye Birdie and most recently AIDA. Recordings include On Your Toes, Lady Be Good and the Grammy nominated Wizard of Oz. He is also active as a private coach for musical theatre dance, song study, and tap. For the Variety Children’s Theatre, he has directed The Adventures of Tom Sawyer, Oliver!, The Wizard of Oz, ANNIE, The Little Mermaid, Mary Poppins, and Beauty and the Beast which earned him a St. Louis critics nomination for best choreography. He and his wife, Kristen, are the proud parents of Charlie, Elizabeth, Katherine and Maggie. Kristen Teeter is currently the director of the dance program for Nerinx Hall High School in St. Louis. She holds a Bachelors in Dance with Honors from California State University at Fullerton and has been fortunate to perform, choreograph, teach and study all over the country, including in LA, NYC and Chicago. In addition to extensive studio teaching in Los Angeles and Chicago, she has guest taught and choreographed for various high schools around the country as well Northwestern University and Cal State Fullerton. She is a regular sub and guest teacher at Webster University and also teaches frequently for COCA, the Center of Creative Arts. With her husband, director/ choreographer Lara Teeter, she runs frequent workshops and intensives training young artists for professional careers in musical theatre and dance, and spends time consulting parents on navigating the professional "kid theatre" world, including audition prep, resume formatting, agent seeking, professional conduct, juggling school and "the business," and more. Two of her four children are active theatre/dance kids and her oldest daughter already boasts 3 Broadway shows on her resume. Thus, Kristen frequently divides her time between residing in Saint Louis and New York City to manage her daughter's professional performing career and continue her own personal professional development training as a dance educator. Spencer Milford is a Webster Groves native who has been a part of the St. Louis theatre community for 14 years. A former Muny Kid and Teen, Spencer returns to The Muny this summer as Davey in Newsies August 7th-13th. He has performed with numerous companies around town including The Rep, STAGES St. Louis, Opera Theatre of St. Louis, Insight Theatre, and Variety Children's Theatre. Outside of St. Louis, he appeared on the National Tour of Billy Elliot The Musical and How The Grinch Stole Christmas. Spencer made his Broadway debut at the age of 17 playing the title role of The Winslow Boy. In the fall, he will be attending graduate school at The Royal Conservatoire of Scotland. Larry Pry has been teaching voice, piano and musical theater for over 20 years. He graduated from Southern Illinois University at Edwardsville with his degree in Music. After spending 18 years with The Muny theatre in St. Louis as the Assistant Marketing Director/Publicity Coordinator/audition pianist, Larry has recently joined the staff of The Ronald McDonald House Charities of St. Louis .He also serves as an adjunct professor at Webster University in their Conservatory of Musical Theatre, where he teaches Song Study and music directs. Larry serves as a professional musician/keyboard player/clinician around the country. Some of his favorite musical experiences include performing with The Beach Boys, singing/dancing with Charo, performing in London, and music directing the Papal Visit to Denver in Mile High Stadium. Melissa Gerth is a dancer, actor, singer and teacher. She has performed a variety of roles with the James Robey Dance Company, Edgar Cortez Dance Theatre, Axial Theatre Company, Mustard Seed Theatre, Metro Theatre Company, ITC, Insight Theatre Company, Variety Children’s Theatre and Downtown Cabaret Children’s Theatre Company. Melissa has presented and performed her own creative work in both the Saint Louis and Rome, Italy Fringe Festivals. She has taught yoga at Wat Suan Mokh in Chaiya, Thailand, singing at Mahidol University in Bangkok, movement and voice at Fontbonne University, yoga for actors at Missouri Baptist University, and currently teaches yoga and dance at Webster University. She holds a BA in Voice from the University of Akron, 500-hr yoga teacher certification from the Kripalu Center for Yoga and Health, and an MA in Theatre from Fontbonne University. James Robey is author of Beginning Jazz Dance and Robey Jazz Dance Technique and Syllabus™, and an Assistant Professor and Chair of the Department of Dance at Webster University. James was Founding Artistic Director for the Bare Bones Dance Project in New York City and James Robey Dance in Connecticut. He danced professionally with the Metropolitan Opera Ballet Company in New York City, Connecticut Ballet, GroundWorks Dance Theater, New York Dance Theater, Off Center Dance Theater, Ohio Dance Theater, Covenant Ballet Theater of Brooklyn, Cleveland Opera, Disney World, Tokyo Disneyland, Norwegian Cruise Lines, and Busch Gardens. Christine Kardell is an independent dance teacher, choreographer, and certified GYROTONIC® trainer and GYROKINESIS® instructor. She holds a Bachelors Degree in Psychology from the University of Missouri and a Masters Degree in Liberal Arts from Washington University. She has comprehensive ballet pedagogical knowledge as well as extensive experience in choreography and musical theatre. Ms. Kardell owned and operated her own dance studio, DuFrenne Dance Academy, for many years and has been an adjunct faculty member at Webster University, University of Missouri-St Louis, and guest faculty for Stephens College, Perry-Mansfield Performing Arts School and Camp, and the American College Dance Festival. She worked at COCA, The Center of Creative Arts, as the Pre Professional Division Manager, Rehearsal Director for Ballet Eclectica, and member of the dance faculty teaching advanced ballet, pointe and variations, jazz, choreography, and floor barre. Ms. Kardell currently conducts independent dance/movement workshops throughout the Midwest as well as private lessons to promising young dancers. Ms. Kardell has been training in the GYROTONIC EXPANSION SYSTEM®, a movement, rehabilitation, and body conditioning system created by Juliu Horvath and is a Level 2 Certified trainer. Since becoming certified, Ms. Kardell has enriched her movement knowledge by completing the GYROTONIC® Applications for Dancers course, becoming certified to teach on the specialized Jump Stretch Board and Leg Extension Unit, and completing her GYROKINESIS® certification. Through her experiences as a former professional dancer, choreographer, business owner, university teacher, yoga practitioner, and movement educator, Ms. Kardell is able to provide students of all levels with the essential guidance and instruction to realize their full potential effectively and safely. About Gyrokinesis: The GYROTONIC EXPANSION SYSTEM®is a holistic approach to movement that is designed to meet the needs of people of all ages and abilities. Gyrokinesis exercise sequences are composed of spiraling, circular movements, which flow together seamlessly in rhythmic repetitions, with corresponding breath. Each movement flows into the next, allowing the joints to move through a natural range of motion without jarring or compression. These carefully crafted sequences create balance, efficiency, strength and flexibility. renewed energy, vitality and a general sense of calm and well-being. Amy Scheers is the Executive Director of the Fox Performing Arts Charitable Foundation. Prior to this position, Amy was the Director of Program Design and Production at COCA – Center of Creative Arts, where she led the organization’s efforts in successfully achieving two national arts accreditations. For the 10 years prior, she was COCA’s Director of Dance and the founding Artistic Director of COCA’s Ballet Eclectica. Amy taught at Alexandra School of Ballet and was their company manager and ballet mistress for 7 years. She began teaching in New Jersey in 1995 and assisted in the founding of the Belle Meade Ballet. Amy earned her BFA in Dance Performance from Butler University, and went on to perform with Ballet Theatre Pennsylvania under Artistic Directors Trinette Singleton and Nana Badrena. Keith Tyrone Williams, a proud native of East St. Louis, Illinois, has performed, directed and choreographed throughout the United States and extensively in Europe. No stranger to the Black Rep, Keith performed as the Devil Applegate in Damn Yankees (Woodie King Award Winner), Tin Man in The Wiz, and choreographer for Bubbling Brown Sugar, Raisin, and Black Nativity. Most recently, Keith directed, choreographed, and produced his company, Innervision Dance Theatre’s production of The Ties That Bind, returning at the Sun Theatre in the Spring of 2017. He also co-starred in The Full Monty at Stages St. Louis for which he won the prestigious Kevin Kline Award. His choreography for Sarafina, a musical about South African apartheid, received rave reviews and garnered him another Kevin Kline Award for best choreography. Keith is also a distinguished recipient of the NAACP Award for his contributions to the cultural arts and Arts-In-Education and a 2014 St. Louis Regional Arts Commission Fellow. As an arts educator, Keith serves as Chair of Theatre at Grand Center Arts Academy in St. Louis, MO., and is committed to the achievement of arts and academic excellence in instruction which fosters an awareness of cultural diversity, stimulates imagination, and promotes literacy. His Broadway, national, and international credits include Once On This Island, Legs Diamond, Five Guys Named Moe (LA Ovation and NAACP nomination), The Music of Andrew Lloyd Weber (British Royal Command Performance), Bubbling Brown Sugar, Starlight Express, and Katherine Dunham Gala at Carnegie Hall. Keith is very proud to be among the few people certified by Katherine Dunham to teach the world renowned Dunham Technique, and served as co-writer and appeared in the historic documentary on Dunham Technique with the Library of Congress. Keith holds a BS (SIUE), MA, and completing his MFA/Directing with an emphasis in Arts Management (Lindenwood University). Angela is an actress, filmmaker, and private coach. After spending over a decade in LA and Chicago, she returned to her hometown to continue working in the entertainment world. In addition to films, commercials, live hosting, and corporate videos, Angela’s voice can frequently be heard on radio spots. Her directorial debut was the award-winning film, “Must Fool Everyone,” in which she co-wrote with her brother, who played the lead. Angela and her husband, Benjamin Hochman, collaborated to create a TV concept called, "Your St. Louis," in which the two explore hidden gems that make their hometown a very unique city. She also just began a podcast, “And…Action! with Angela” where she conducts brief interviews with people in show business.